Dabu is a hand-block, resist printing technique from Rajasthan that uses mud instead of paint to create pattern on textiles (dabu comes from the word dabana, meaning ‘to exert pressure’). It is highly labour intensive, requiring many stages of textile preparation, printing and dyeing. The pattern is marked out on the textile using the hand blocks, then the mud paste (a mix of soil, gum and lime) is applied to the parts of the pattern that are to resist the dye, either by hand if it is a large area or using the blocks if more detailed. Finely ground waste wheat chaff is sprinkled over the paste to help it set. The textile is dyed, left to dry in the sun, then washed to remove the mud and dried again. Several more stages of resist and dye may take place, depending on the complexity of the pattern and colour. 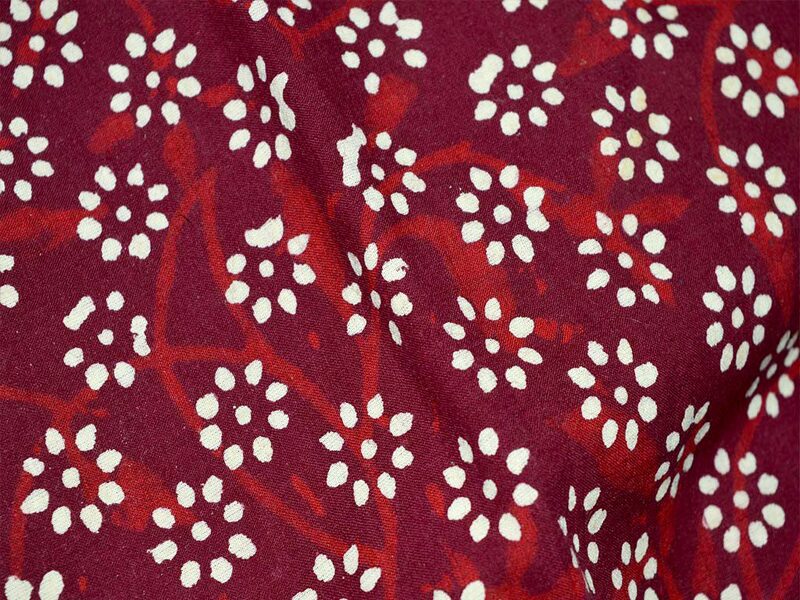 Normally dabu is printed onto cotton, but silk, crepe and georgette are also used to produce saris and dress materials. Designs and motifs include mangos, peacocks, cornstalks and plants, and geometric shapes and dots. Bindaas is a form of slang that originated in Mumbai and is now used in common parlance across India. It is a corrupted version of the word Marathi bindhaast, meaning ‘the one who has no fear’ or ‘fearless’ (bin means ‘without’ and dhaasti ‘fear’ or ‘worry’) and in this form is used in regularly in polite Marathi conversation. It indicates anyone who does things that he or she wishes to without any doubt or anxiety. The word was probably popularised by Hindi movies and is now used to mean ‘cool’, ‘unrestrained’ or ‘carefree’. Bindaas indicates there is nothing to worry about, and directs someone to feel free, to chill out. Depending on the speaker’s point of view, the same word is used in two different ways: ‘You will like him. He’s total bindaas!’ or ‘Bindaas movie. Leave your brains behind!’ It is a favourite for Bollywood film and song titles, where it refers to the ultimate cool dude. 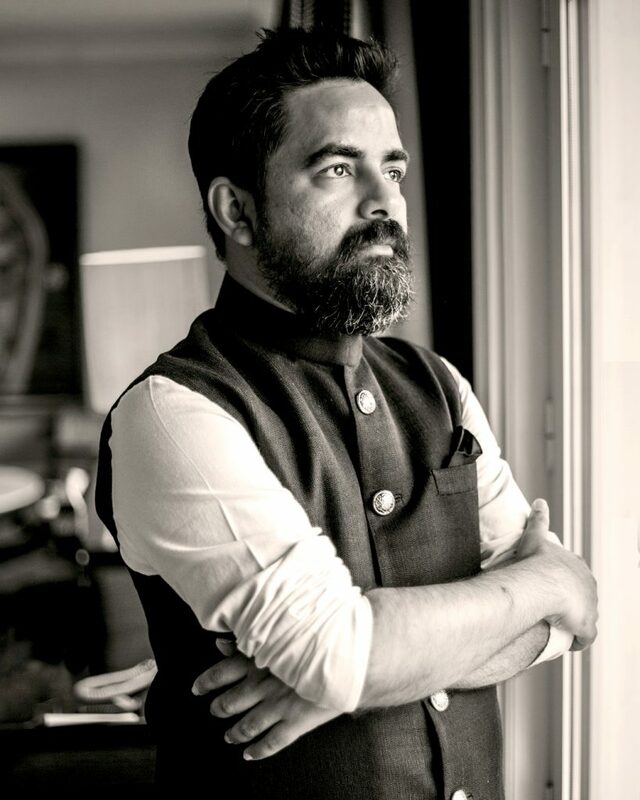 Sabyasachi Mukherjee is a celebrated Indian fashion designer. He sells his designs under his eponymous label, pioneering the use of indigenous textiles in a modern context. He won Femina British Council’s most outstanding Young Designer of India award just two years after graduating, and is an associate member of the Fashion Design Council of India. Sabyasachi has designed costumes for star-studded Bollywood films such as Baabul, Laaga Chunari Mein Daag and Raavan, as well as all the clothes worn by the late Sridevi in English Vinglish. His celebrity clientele include stars from Bollywood and Hollywood. Sabyasachi was born in Kolkata in 1974. His parents wanted him to become an engineer, but from an early age Sabyasachi was in awe of fashion pioneer Rohit Khosla and knew he wanted to do fashion design. He studied at the National Institute of Fashion Technology, starting his own label just four months after graduating in 1999. The British Council award led to an internship in London, and he returned to produce collections that have been showcased in London, Italy, Malaysia, Singapore and New York. 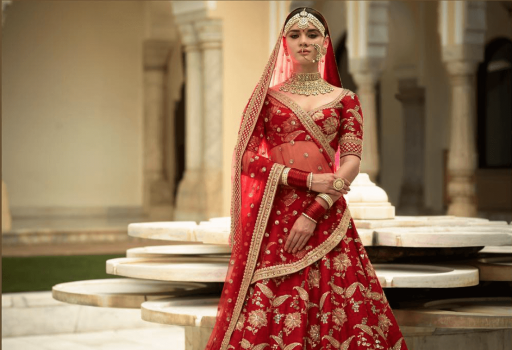 Credited with a vibrant imagination and an artistic sense of colour and graphic vision, Sabyasachi’s collections combine Indian ‘ethnic’ fashion with global influences. He is inspired by the antique textiles and indigenous methods of textile production of India, but also draws on influences from the West, using unusual fabrics, texturing and detailing to fuse styles. He calls his work ‘international styling with an Indian soul’. Recent couture collections have focused on bridal wear, but he is also known for influencing revivals of fabrics from cotton khadi to opulent Banarasi silk, and supporting traditional methods of weaving. The Parsi Zoroastrian community, who migrated to India from Persia between the eighth and tenth centuries, brought to the west coast of their new country a fondness for mixtures of meat and vegetables or meat and fruit. This was influenced by the Gujarati love of sweet and sour and Indian spice mixtures. Dhansak is traditionally made with four different sorts of lentils and eaten with caramalised brown rice and fried onions. The lentils are soaked overnight, and then simmered with onions and turmeric. 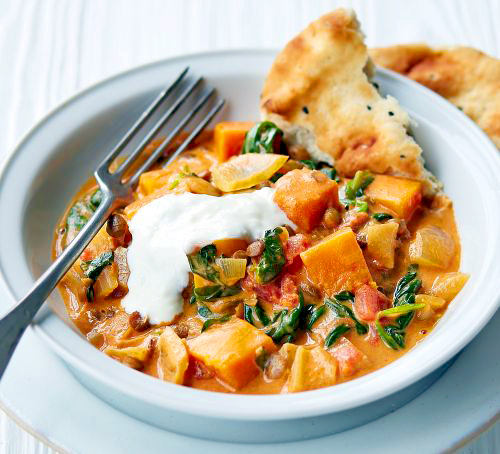 Chopped vegetables such as aubergine, potatoes, tomatoes and pumpkin, ginger, garlic and coriander are added, and when the pulses are soft the mixture is mashed to a puree and set aside. The spice mix – cumin, coriander, chilli, cardamom, cinnamon, mustard seeds and fenugreek seeds – are fried with ginger and garlic. Tomatoes and green chillies are added, then the meat (lamb is traditional, but chicken can be used) until browned. The meat and spice mix is added to the lentil puree with stock, jaggery and some lime juice, and then simmered until the meat is cooked. Dhansak is a traditional Sunday dish in many Parsi homes.